In February, 1984, the Love Over Gold (live)/Solid Rock single was released. The double live Alchemy album came out the following month peaking at #3 in the UK album charts. Mark played on Blanket Roll Blues, a track on Scott Walker’s Climate of Hunter album. In April, Mark was brother David’s guest performing Madonna’s Daughter at the Ariston Theatre, San Remo. Local Hero was nominated for ‘Best Score’ BAFTA and Mark wins an Ivor Novello Award for ‘Best Film Score/Theme Song’ for Going Home. In June, Mark produces Knife for Aztec Camera. July sees the release of the Comfort & Joy/A Fistful of Ice Cream EP. Mark’s second soundtrack, Cal, was released in September supported by the issue of The Long Road/Irish Boy single. In November, Cliff Richard’s The Rock Connection album is released featuring Mark on the tracks She Means Nothing to Me and I’ll Mend Your Broken Heart. From late ’84, recording begins for the Brothers in Arms album using the band’s own digital 24-track machine at Air Studios in Montserrat, West Indies. The recording of Brothers in Arms continues into 1985 but in April, Hal Lindes leaves the band and is replaced with Jack Sonni. Guy Fletcher is drafted-in for additional keyboards. On holiday with his family, Sting calls into Montserrat’s Air Studios during the recording of the Brothers In Arms album and is roped into singing an intro to Money for Nothing. The album is completed at the Power Station studios in New York and the So Far Away/Walk of Life single is released. On the 25th of April, the Live in ’85 tour starts and will cover 23 countries and a total of 248 shows in 117 cities, seen by over two and a half million people with 11 trucks carrying 52 tonnes of equipment. Saxophonist Mel Collins leaves the tour after just three weeks due to ill health. Chris White joins the band. May ’85 sees the worldwide release of the Brothers in Arms album which becomes one of the very first major albums to be issued in the new CD format. Music videos are released for So Far Away, Money For Nothing, and the title track, Brothers In Arms. The album enters the UK album chart at #1 and stays there for three weeks. It remains at #1 in the US for nine weeks and hits #1 in a further 22 countries. In June, Money For Nothing/Love Over Gold(live) are released as a single and Dire Straits receive a Nordoff-Robbins Silver Clef award for ‘Outstanding Services to British Music’. Prince Charles and Diana, Princess of Wales, attend one of seven shows at Wembley Arena in July. Channel 4 broadcast the 10th of July gig. During the afternoon of the 13th of July, the band walk across the car park from Wembley Arena to play at Live Aid before a TV audience of 3 billion and then stroll back for that night’s gig at the Arena. 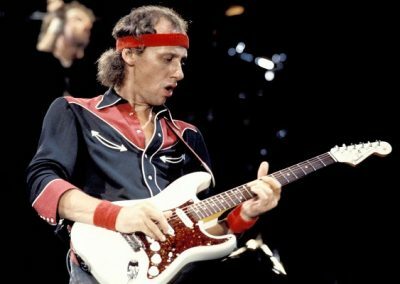 Paul Brady, Francis Rossi, Hank Marvin, Nils Lofgren, Sting and T-Bone Burnett are among the guests joining Dire Straits on their Wembley Arena gigs. The Money For Nothing video is issued on the 1st of August together with the Brothers in Arms (short version)/Going Home/Brothers In Arms (long version)/Why Worry single. In September, Money For Nothing reaches #1 on the US Hot 100 chart and provides Dire Straits with their first #1 single in the US. Mark appears on the David Letterman Show in the USA, the band playing Expresso Love, and in October the band is joined on stage by Billy Joel at New York’s Madison Square Garden. In the same month, two singles are issued: Brothers In Arms/Going Home and Brothers In Arms/Going Home/Why Worry. At the end of November ’85, Sting joins the band on stage at the Palais Omnisports de Bercy gig in Paris. 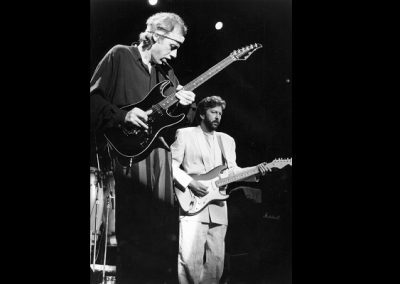 1985 ends with the band performing an astonishing 23 straight nights in the UK during which they are joined on stage at Hammersmith by Eric Clapton, J J Cale, Paul Young and Hank Marvin. 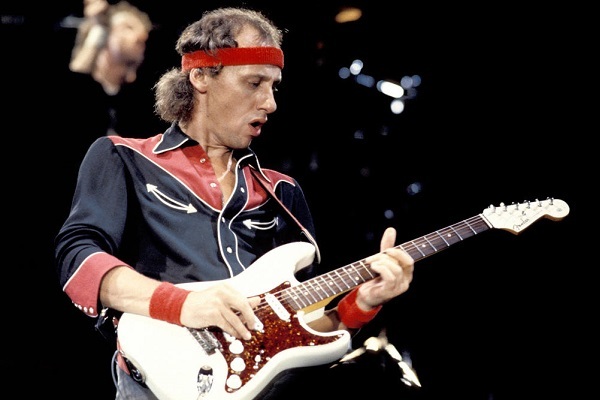 1986 began with the release of the singles Walk of Life/Two Young Lovers and Walk of Life/Two Young Lovers (live)/Sultans of Swing(live) together with the Walk of Life/Two Young Lovers (live)/Sultans of Swing (live)/Eastbound Train (live) double single pack. 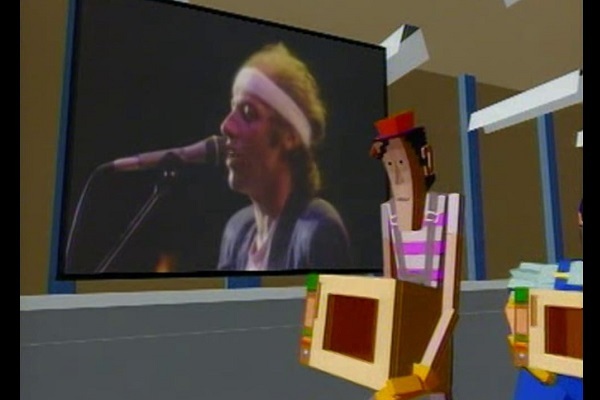 In February, Dire Straits win the ‘Best British Group’ BRIT Award and a Grammy for Money For Nothing. In April, the Your Latest Trick/Irish Boy single is released. Meanwhile, the Live in ’85 tour rolls on. Bob Dylan guests with the band at the Entertainments Centre, Sydney, Australia, and at the Entertainments Centre, Melbourne, Australia. The Live in ’85 tour sees additional shows added at the Sydney Entertainment Centre. A record-breaking 21 shows were performed at the Centre, the last show of the tour being screened live on TV throughout Australia and New Zealand. During their time in Sydney, the band sought light relief by challenging the crew to a cricket match. Michael Parkinson was recruited as umpire. The Live in ’85 tour was a massive undertaking and, despite huge success, it inevitably took its toll. Back home in the UK, Mark felt he needed to touch base and called on old mate, Steve Phillips. On the 31st of May ’86, Mark sat in on a gig with Steve and Brendan Croker (aka Nev & Norris) at The Grove pub in Leeds. Price of entry to the gig was £1 and the three split a take of £66 pounds between them. The following evening Mark joined Steve playing at a gig at The Fenton, Leeds. They were paid £40, that is £20 each. It was at this time that Mark agreed to produce a proposed Steve Phillips/Brendan Croker album. 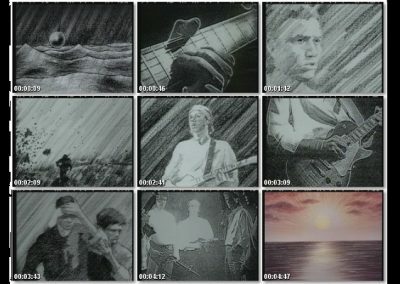 In September 1986, Dire Straits won two MTV Music Video Awards for Money For Nothing and a Canadian International Album of the Year Juno Award for Brothers In Arms. Mark wins ‘Best Country Instrumental Performance’ Grammy (with Chet Atkins) for Cosmic Square Dance and is nominated for ‘Producer of the Year’ and ‘Song of the Year’ Grammy awards for Money For Nothing. Dire Straits win the BPI award for ‘Best British Group’. The Walk of Life music video is released and Your Latest Trick/Irish Boy/The Long Road single is issued. In June, Mark and John play at the Prince’s Trust Gala attended by Prince Charles and Diana, Princess of Wales. By mid-1986, Brothers in Arms had become the world’s best selling compact disc. Mark goes on to produce tracks for Tina Turner and Paul Brady. He also records the music for a TV documentary about the Prince and Princess of Wales titled In Private, In Public. During the summer of 1986, Mark produces a track for the soundtrack of Martin Scorsese’s film, Colour of Money. 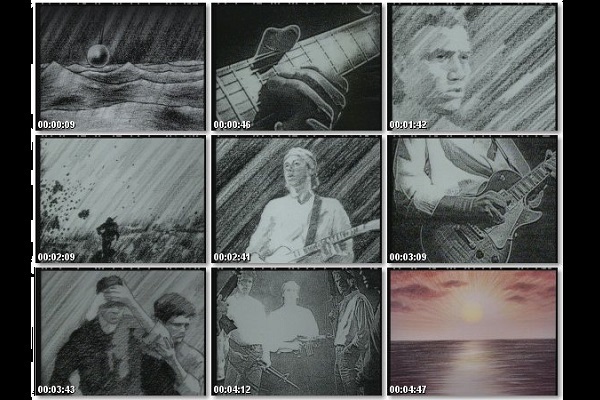 Early 1987, Dire Straits win ‘Best British Album’ BRIT Award for Brothers In Arms and a Grammy for ‘Best Music Video Short’, Brothers In Arms. 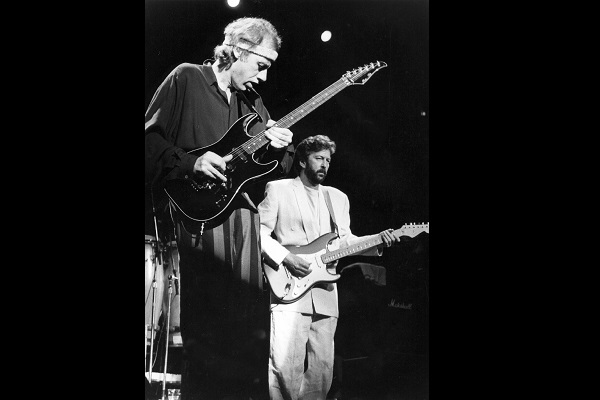 Mark joins Alan Clark and Eric Clapton on stage during Eric’s 25th Anniversary Tour. He also appears with Chet Atkins in March at the London Palladium for two Secret Policeman’s Ball shows. In April, Mark flew to Nashville to take part in a TV special, Tribute to Chet Atkins, and in May he was back in Nashville for AOL Sessions with Chet. Mark played guitar on The Game of Love on Paul Brady’s Primitive Dance album and Why Worry on Chet’s Sail album. In October, he joined up with Steve and Brendan at London’s Mean Fiddler. Recording of the proposed Steve Phillips – Brendan Croker album began at Mark’s old studio in Notting Hill, London. Guy Fletcher was drafted in and within a short time the project evolved into what was to become the Notting Hillbillies. Ed Bicknell is told “We’ve formed a band and you’re the drummer”. 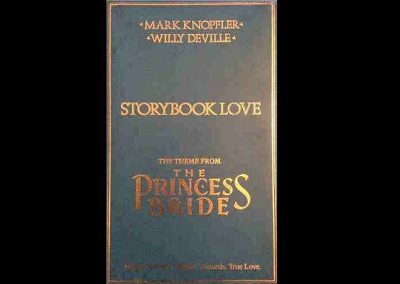 1987 also saw Mark play on guitar on They Dance Alone (Cueca Solo) on Sting’s Nothing Like The Sun album and write the score for Rob Reiner’s Princess Bride which was released in November. Meanwhile n September, Mark won three ASCAP awards for So Far Away, Money For Nothing and Walk of Life and produced and played on Willy DeVille’s Miracle album. In October, the Mark Knopfler & Willy DeVille Storybook Love (Theme From The Princess Bride) single was released. During a trip to New York, Mark and Rudy Pensa sit down for a coffee in a café near Rudy’s guitar store. They discuss Mark’s ideas for a new custom built guitar, sketched out on one of the café’s napkins. On the 11th of February 1988, Granada TV record Mark and Brendan Croker at Manchester’s Band on the Wall for a Celebration documentary about Steve Phillips, the show is broadcast mid-April. The day after the filming Mark, Steve, Brendan, Alan Clark and Guy Fletcher, treated diners to an impromptu performance at the Le Papillion Restaurant, Corbridge, Northumberland. Throughout the Spring and Summer of 1988, Mark works on several tracks for Randy Newman’s Land of Dreams set for release in September ’88. He also plays John Lennon’s Imagine on Chet Atkins’s C.G.P. album and is nominated for a Grammy award for ‘Best Album of Original Instrumental Background Score Written for a Motion Picture or Television’. At the end of May, Mark plays guitar and produces Death Is Not The End on Bob Dylan’s Down in the Groove album. 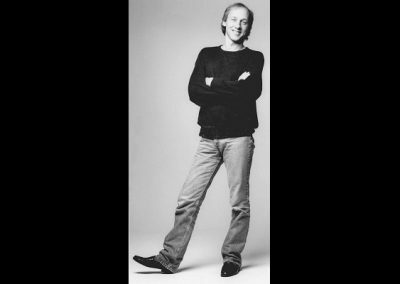 On the 5th and 6th of June, Mark and Alan Clark perform with Eric Clapton’s band at Princes Trust shows at the Royal Albert Hall and later that month Mark performs at the Witness History II concert at the Ryman Theatre, Nashville where he performs Two Skinny Kids, a song about the Everly Brothers. The 8th and 9th of June see warm-up gigs for the up-coming 11th June Nelson Mandela 70th Birthday Concert at Wembley. 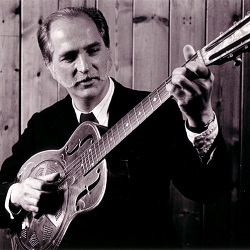 Jack Sonni was unable to attend and so his place in the band was taken by someone who Mark tells the audience “has played before” – Eric Clapton. Shortly before the band were due on-stage a package arrived for Mark. 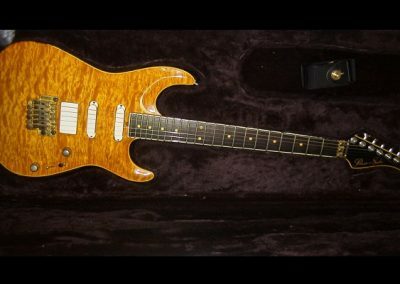 It was the now famous Pensa-Suhr carved-top which Mark played at the gig without even having the time to sound-check his new guitar. In September, Mark and Alan Clark join Eric Clapton for a US tour. 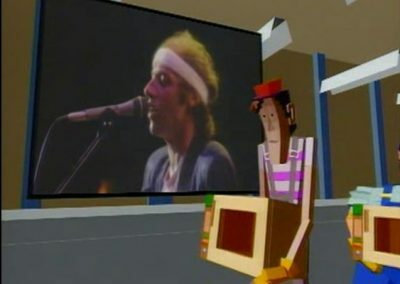 October sees the release of the Dire Straits: Money For Nothing compilation album celebrating a decade of the band’s career. On the 20th of October, Mark appears with Randy Newman on Saturday Night Live and a month later Randy appears with Mark on BBC TV’s Wogan. The Money For Nothing compilation album enters the UK album charts on the 29th of October and reaches #1 shortly after. Mark and Alan Clark make guest appearances at a Brendan Croker & The Five O’Clock Shadows gig at Pontefract, Yorkshire, on the 6th of March, 1989. 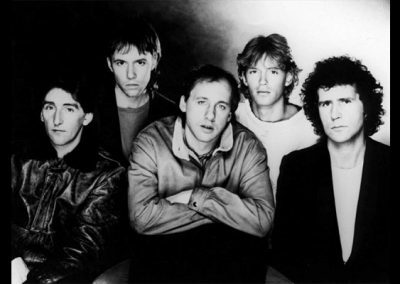 In April, Dire Straits are awarded an Ivor Novello Award for their ‘Outstanding Contribution to British Music’. Mark joined other artists at a charity gig at London’s Natural History Museum on behalf of the Lung Foundation. In June, Mark is the special guest at a Brendan Croker and The 5 O’Clock Shadows gig at Leeds Polytechnic with Steve Phillips opening the show. Mark, Guy Fletcher and Alan Clark play on Brendan Croker’s Brendan Croker and the Five O’Clock Shadows album. During the summer of ’89 the Steve Phillips-Brendan Croker project finally coalesces into the Notting Hillbillies. Mark writes and records the score for Last Exit To Brooklyn and plays on Sweet Dreams and Yakety Axe on Chet Atkins’s Pickin’ the Hits album (re-issued in 1997). 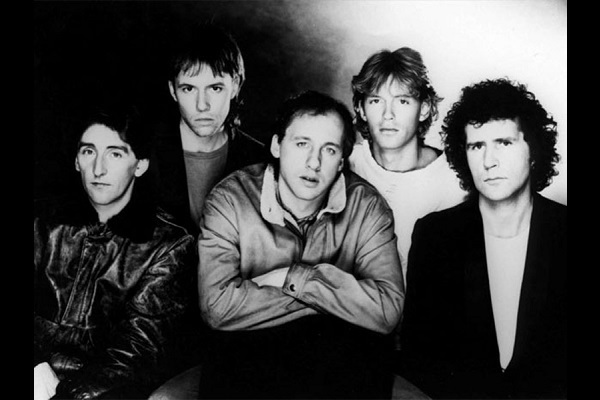 In October, Dire Straits play in front of just 700 people at the Mayfair Ballroom, Newcastle. The gala dinner concert was in support of North East Personality of the Year, Joanne Gillespie, 11 years old, who wrote the book ‘Brave Heart’ about her fight against cancer. Mark becomes a patron of Bravehearts of the North East. Mark plays on the title track on Tina Turner’s Foreign Affair album while with Mark on guitar The Judds record his Water of Love for their River of Time album. On the 7th of December, Mark and other artists assemble at London’s Abbey Road Studios to record a special tribute to Roger Scott. Roger was a well-known Capital Radio and BBC Radio 1 DJ who died of cancer aged 46 on the 31st of October 1989. Accompanied by Guy Fletcher, Mark performs a live version of I Feel Like Going Home. Another highlight of 1989 is the unveiling of a wax model of Mark at Madame Tussauds in London as part of a ‘History of Rock’ exhibition.